I am incredibly pleased that we are kicking off #IndieAdvent today! (Also relieved, as I thought at one point I'd never get this written.) There are three or four bookshops I absolutely love in London, and I'm delighted to give a sneaky preview and say that two of them, Tales on Moon Lane and Gay's The Word, will be featured later on this month in fab guest posts by two superb people. Which means I was able to do one of the others - probably the first indie bookshop I fell head over heels in love with - The Big Green Bookshop, to kick things off! I went to The Big Green Bookshop for the first time in early January, after I'd tweeted asking for recommendations. Amazing agent Hannah Sheppard, awesome author Ruth Warburton, and brilliant blogger Julianne were just three of the many people who recommended the Big Green Bookshop, so I decided it was worth checking out for myself why so many people loved it. It was quickly obvious just why that was! Tim, who co-owns the shop with Simon, recognised me from the launch of Witch Finder the previous week, where he'd been selling copies of Ruth Warburton's book. (It's Tim who you can hopefully just about make out in the above picture, despite my sub-par photography skills!) We talked for quite a while that day and have had several long conversations since then - both Tim and Simon are really knowledgeable, great at recommending books, and incredibly friendly. This also comes across on social media - Simon's tweets are superb; funny, clever and generally optimistic (even on days when sales are low.) The occasional #bgblive hashtag, in which he tweets throughout the day, is a fascinating read. Also, the customer service is superb. I got a DM a few weeks ago mentioning they had a second-hand copy of a book in that I'd previously said I wanted to read and asking if I wanted them to keep it for me - amazing knowledge of their customers! Even better, I tweeted when David Fickling Books revealed the endpapers to The Art of Being Normal by Lisa Williamson (have I mentioned this is an AMAZING book?) saying that I'd be messaging the Big Green Bookshop in the morning to pre-order, and got a reply to that tweet within a minute saying that it was sorted for me. This was at 10:51pm! As well, they do a book club which I will sign up to at some point - you can sign up for three months, six months, or twelve months and get gift-wrapped books delivered to you at the start of the month, which just sounds like an AMAZING idea! There's an adult one and a children's one, with the children's recommendations being chosen with help from the wonderful Books For Keeps magazine! They also have some incredibly imaginative events - including an amazing-sounding one for the launch of Haruki Murakami's latest book, Colorless Tsukuru Tazaki and His Year of Pilgrimage, which was released at midnight on August 11th. It featured sushi, wine, a screening of a film by Murakami's favourite director, and the awesome Scott Peck and Stuart Evers talking about Murakami. A jealousy-inducing round-up can be found over at Lonesome Reader. Earlier this year, they also hosted a pitching event with fabulous agents Ella Kahn and Bryony Woods, making me wish I had a polished final draft ready to show people and pitch! Oh, and music, as well - Judy Dyble, the wonderful Fairport Convention vocalist, played there last month. Seriously impressive. In addition to the fabulous events, they're great at spreading the word about books to local schools - they celebrated World Book Day by visiting schools with the fabulous Jackie Marchant, who writes the excellent Dougal Trump books, and Allan Boroughs, whose Bloodstone is near the top of my 'must read' list - Ironheart is wonderful! I was incredibly thrilled that James Patterson gave them some money earlier this year, as part of his £250,000 grant to independent bookshops in the UK & Ireland, and they're going to be using it to allow them to invest more time and energy into their school visits, which sounds amazing. If I was buying a Christmas present here, I would buy Chris Priestley's The Last Of The Spirits, a wonderful story of Victorian Christmas based on Charles Dickens's A Christmas Carol, to give to my dad, and bring back memories of the number of times we've watched adaptations of the Dickens story as a family. I think he'd love this stunning novel, which follows two rather surprising characters as we see the tale of the night which changes everything for Ebeneezer Scrooge from a very different angle. You can check out my review here, although I don't want to say too much more about this, because I'd rather let Chris talk for himself about it - and if you check back here at lunchtime, he'll be doing just that! For more about The Big Green Bookshop, check out their excellent website and blog. 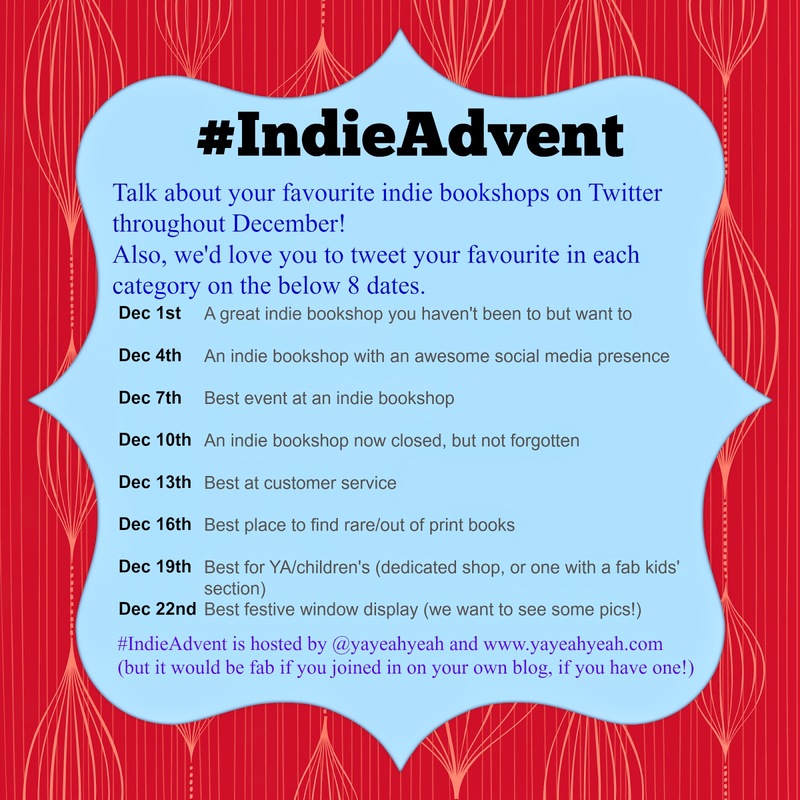 For more on #IndieAdvent, check out the below graphic. It would be great if you wanted to join in tweeting - your favourite bookshops throughout the month, and today, we also want to know what bookshops you haven't been to that you REALLY want to visit! BGB is indeed a lovely shop and venue (and not just because they stock my book, although cheers for the shout-out, Jim). I'll add extra emphasis to the writing/critique groups, who meet on alternating Wednesdays and have done for my writing than almost anything else. They're all good people to boot. If you're in that vague area and into writing, they're worth a look.